Pavé would like to thank Laekhouse for supporting our coverage of the 2011 Giro d’Italia. Mark Cavendish finds himself enmeshed in scandal more often than other racers, it seems. He felt unfairly penalized when his teammate, Mark Renshaw, was ejected from the Tour de France last year for headbutting Garmin’s leadout man, Julian Dean. He felt unfairly demonized when the peloton reacted against him for crashing into Henrich Haussler during a spring in last year’s Tour de Suisse (the injury took a just-returned Haussler out for the rest of the season). On Stage 2 of this year’s Giro, Cav reacted against Alessandro Petacchi’s sprinting, claiming that he himself would have been relegated had he sprinted like Ale-Jet did, and calling for the rules to be enforced fairly. The latest scandal involves rumor that he hitched a ride on his team car up Mt Etna, keeping his legs fresh while sprint rival Alessandro Petacchi was pounding away at the front of the peloton. 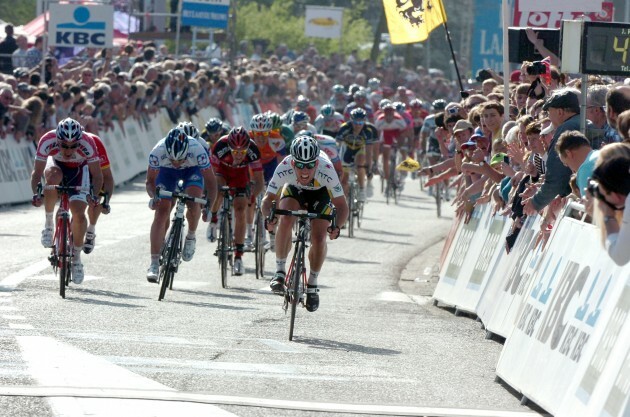 If it’s true, it paid off – he blew Petacchi out of the water the following stage. It should be noted that getting modest assistance is part of bike racing – returning riders to the bunch after a flat, a mechanical, or a crash is quite common and doesn’t render assistance that makes a difference in a race. The “sticky bottle” is a common form of food and velocity support even to riders in breakaways, though commisars doubtless keep a closer eye on them. Getting towed up a mountain and finishing within the time cut-off, when other sprinters were unable to do so and were thus removed from the Giro, however, is a much more significant breah of the rule and the spirit. Reports of Cav’s free ride up Mt Etna are just rumors – thus far there appears to be no photo or video proof of it. Are rivals sullying his image? And so, discuss: is Cavendish regularly discussed in unflattering terms because of occasions where his mouth is quicker on the draw than his brain? Or is he unfairly penalized because of his sprint dominance? This entry was posted in Featured and tagged Cavendish, giro d'italia, sprinting. Bookmark the permalink. Mario Cipollini had some harsh words for Mark Cavendish in his daily column in La Gazzetta dello Sport. First, he criticized HTC for leaving Cavendish isolated in the sprint before questioning the Manxster’s commitment to his profession. No word yet from Cavendish, who will line up as the hot favorite for victory in Thursday’s flat stage to Ravenna. Cavendish is faster than anyone else. In fact, he's probably the fastest sprinter in the history of the sport. His presence significantly reduces the chances of every other sprinter in any race he's taking remotely serious. That breeds resentment. In fact it breeds a lot of resentment. That doesn't mean that Cavendish never deserves criticism, but it does mean that he gets more than his fair share of it. On another note, Cipollini might do well to remember that he used to rack up large numbers of Giro wins by this point in the season because the Giro organisers used to specially present him with flat stage after flat stage. Cavendish has a mere one Giro victory this year because it has an outlandishly climbing-focused parcours. And for quite a bit of his period of dominance Cipollini was the only sprinter with a real train, while Cavendish has to contend with rivals who are almost (but not quite) as well serviced by their teams as he is. Nonetheless, does Cav get a raw deal? He has in the past. He has deserved getting dished out accordingly as he has whinned in the past, but he is a sprinter, and they are openly a different breed within the peloton. They are arrogant, because they are cheetahs. They are cocky, because they rack up wins like a hot date on prom night. They shoot their mouth off, well, because they can. However, look at Cav in his entirity, he has matured. I can remember him offering apologies on more than one occasion, which is more than Cipo did when he would berate his competition. Cav has learned alot, and i give him credit for that. Now, in the Giro, Petacchi has won fairly, Cav has won fairly and rumors are rumors. Also, on another note, Petacchi has shown great guts by stomping it and riding w/great panache up Etna as he helped his team lead out, that was impressive to see a sprinter do that! I said "probably" the fastest sprinter in the history of the sport. I'm open to counter-suggestions, but I really can't think of any specialist sprinter who had anything approaching his palmares by his age. There are sprinters who were much better all around riders than him, Sean Kelly for instance. But within the narrow specialty of mass field sprinting, I have a hard time even coming up with a viable alternative candidate.